The teacher really does make a big difference in how a student will learn. It’s like the difference between positive reinforcement and negative reinforcement when training horses. When we have equine behavior that is not what we want, it is easy to judge the animal as bad and either punish it or reprimand it. This is the same as a teacher trying to fix what is wrong with a student. We can make the choice to understand that most often the student (horse or human) has within them exactly the right behavior, the behavior best for themselves and us. Figuring out how to bring that desirable behavior forward is the key. Establishing that behavior as being the student’s own idea and choice really initiates a higher level of learning. Rather like it being a student’s own idea to study their lessons or practice the piano. The big question is how to have this result. I think a real key to this is the attitude of the teacher. It is not so much what the teacher knows but how they teach what they do know. Some teachers are able to inspire students to take the initiative to learn and others make learning drudgery. Rather than focusing on what we do not want from the student, teachers can choose focus on what the student can do and then expand on that. This way the teacher does not have to ‘reinvent the wheel’ so to speak. Allowing the wheel to keep rolling, but perhaps modifying the direction or speed could be the answer. Teachers might consider offering suggestions and various choices to students (again humans or horses) rather than telling them what to do. An interesting skill for the teacher is to know when a particular choice that is offered has a natural block to forward movement or progress. An example with a horse might be that if the horse wants only to move to the right and not turn to the left, the trainer can, when holding the horse with a long line, position themselves and the horse so that the horse moves at a walk or slow trot, without excitement, into a fence or wall every time it goes to the right. When it goes to the left the horse is offered open space and removal of the pressure (a calm few moments) of the request as its reward. Thus the trainer makes what they want easy and pleasant for the horse and what they do not want somewhat difficult without imposing a reprimand or punishment. 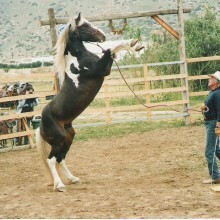 A horse most often will look for the easy way out or the way of least resistance to its movement. Additionally, recognizing and rewarding effort by a student is extremely important. For a horse, rewarding the effort is how to keep the animal trying. If it keeps trying it will eventually succeed and begin to learn of its own accord, which is always best. The same goes for a human student. Saying “good boy” or “good job” is like a pat on the back and positive reinforcement. Removal of pressure and a few moments of total peace is a super reward for the horse. Offering children praise for decent effort is a good thing. Being careful not to bribe a child, or horse, is important. Focusing on what is right is a great way to motivate learning and to build on an individual’s good effort. I think another aspect of a superior teacher would be to not bring personal problems, upset and angry feelings into the classroom. Certainly we can all have off days. There are days when we would rather be somewhere else other than where we are. The ability to focus in the ‘present’ can do wonders to assist us in keeping a decent attitude. There is an old horseman saying that goes “leave your problems at the barn door.” While I think most would agree that not bringing our personal problems to our students is a good idea, hiding a down day behind a false smile is not so great either. Nobody can feel up all the time. But teachers who allow too much of a negative attitude into their teaching area, classroom or arena, show little self-awareness or awareness of the detrimental effects their attitudes can have their students. Attitudes tend to be contagious. So teachers/trainers need to be mindful of how their mood affects students, as well as finding appropriate ways to be honest with their feelings. The lack of integrity behind a false smile is often obvious and can turn off the desire to learn from that teacher. I think being true to our feelings and yet not laying them on others is a learnable skill that takes practice and awareness. Another great way to teach is by example. For instance, if we want a calm horse we need to be calm when interacting with it. If we desire our students to be more focused we, as teachers/trainers, need to develop our own ability to remain focused. When we are consistent we support those around us in being consistent. When a teacher/trainer is consistent in a positive way the odds at success are greatly increased. For me it was always better if I was asked to do something rather than told to do it. A suggestion gave me the freedom to really do something because I wanted to. I think it is best to make any request very precise with a horse as they get confused easily. Confusion creates fear within a horse. Also, a request tends to have better energy than telling or giving a command or order. Precision in the communication is a more important than forceful or loud energy. The story about an English speaking person trying to talk to a Japanese speaking person and eventually shouting trying to be understood is often the reality of not being understood. A common language is very important. The same situation with a horse is when we make a request in a normal tone and volume (asking calmly), and if we do not get a good response we begin to use more and more volume, energy and then force. This is shouting to a horse. It is not the volume of the speech; it is the clarity that gets the point across. This goes for human students too. Never taking anything a horse or human does personally can help us to be calm and precise in our communication. If we take anyone’s behavior, or what they say, personally, it is easy to get angry, upset and lash out to get back at them. I believe the truth in this situation is that the speaker is saying more about themselves than who they are speaking to. Also, it is helpful to have the understanding that there is possibly something inside of us that relates to what the other has said or done and this has prompted our negative reaction. Taking a look at what is not pretty or nice within us can be very upsetting. In this case, it is actually ourselves we are angry at and not the other. But often it is their ‘baggage’ that is prompting their outburst or attack. If we can accept that any perceived aggression or attack is actually a call for help from someone who is suffering, then we can more often maintain our own inner peace and perhaps find a way to help that individual find there’s. This requires a lot of kindness and compassion which are always good things for us to develop more of. Never get angry at or blame a horse for its behavior. All unwanted equine behavior is the animal showing its fear. If we are afraid, we are suffering and it is the same for the horse. In the face of suffering it is easier to respond with compassion. If we take the horse’s behavior personally, it is easy to get angry, judge the animal as bad and seek to punish them. Horses are always innocent, no matter what the situation. In conclusion, I think it is obviously desirable to want to be a good and effective teacher or trainer and to work at it. This takes patience, time and attention to achieve. Most important is to simply do our best all the time. Consider the wonderful benefits for the human or equine student, and the teacher, by taking this path as trainers and educators. We are all students and teachers for each other (from the Principles of Attitudinal Healing.